All girls dream of being a princess. Girls love dressing up and having tea parties. Le Petite Princesse Spa & Tea Parlour provides this unique princess experience. We provide royal celebrations from individual princess transformations to birthday events in a fairytale kingdom. Le Petite Princesse Spa & Tea Parlour is not only a fun loving atmosphere but it is a place where girls can explore an infinite amount of possible combinations of ideas. Girls can imagine, pretend, and create memories for a lifetime. Our fairy godmothers converse friendly conversations such as the importance of keeping our bodies active, healthy and strong. 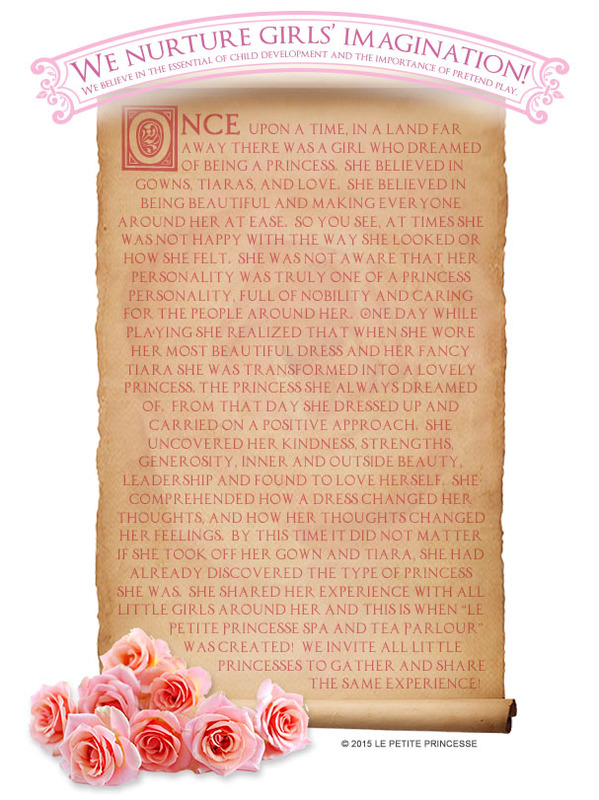 Also the importance of what it takes being a princess. After all being a princess is more than wearing a gown and a tiara, it’s a combination of elements a girl should adhere to on a daily basis. Le Petite Princesse Spa & Tea Parlour is a one of a kind destination for birthday parties where girls can be girls and a place where parents can reward positive behavior. Parents can relax and enjoy our luxurious spa and tea parlour by leaving all the planning, décor, and royal treatment to our fairy godmothers. We provide an Enchanted Setting: Full of Smiles, Gowns, Tiaras, and Magic! Our services consist of a royal treatment: Manicures, Pedicures, Chocolate Facials, Make Up, Hair Style with Glitter, Dress Up, Fashion Show, High Tea Parties, and Character Experience. In addition, we offer Mommy & Me or Best Friend packages. To participate girls must be between 3-12 years of age and be accompanied by an adult (18 years of age or older).